Designing for the Ageing Market | Welcome to our website! 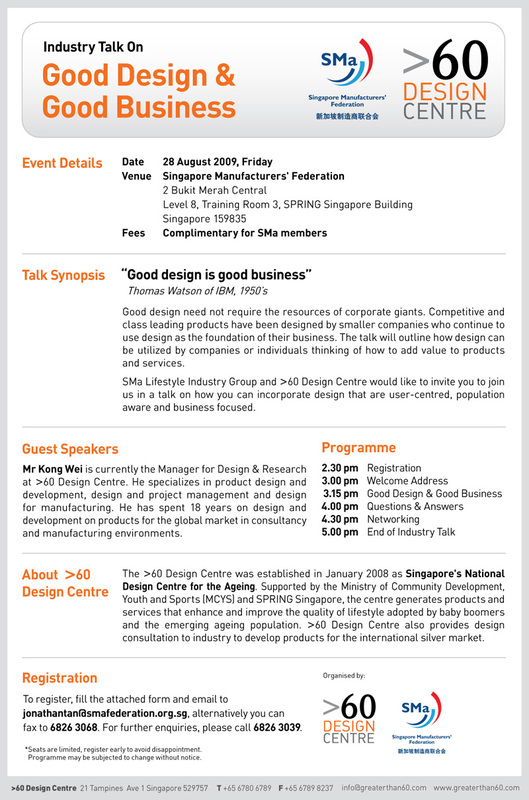 SMa Lifestyle industry group together with >60 Design Centre would like to invite you to join us in a industry talk on how design can enhance your company’s product and services on Friday, 28 August 2009, 2.30pm. The Global Ageing market is relatively untapped target market. Given that the maturing seniors are part of the post-war generation are more highly educated than their parents, more widely travelled and also more affluent, it is expected that their lifestyles will demand new services and products. >60 Design Centre is Singapore’s National Design Centre for the Ageing, supported by the Ministry of Community Development, Youth and Sports (MCYS) and SPRING Singapore. The centre generates products and services that enhance and improve the quality of Lifestyle adopted by baby boomers and the emerging ageing population. This talk will provide you with a good insight on how you can incorporate design elements that not only cater to your business needs but also age friendly. To register, please complete and return the attached form by fax: 6826 3068 or email: jonathantan@smafederation.org.sg. Don’t miss this great opportunity to find out how your business can tap this market through design.